At Van Horn Aviation, we design, certify, and manufacture composite rotor blades that improve the fiscal and physical performance of various legacy helicopters. 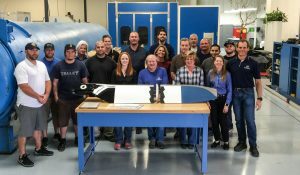 Our mission is to produce composite rotor blades that breathe new life into legacy aircraft. We strive to give aircraft owners and pilots an overall better experience when flying their VHA blades compared to the OEM metal blades. VHA’s composite rotor blades are ruggedly designed with service lives at least twice as long as the OEM blades. But since VHA blades only cost a fraction more than the OEM blades, direct operating costs are reduced by 50 to 80 percent when using VHA blades over their full life. VHA blades also provide various performance improvements (depending on the blade), from reducing noise and pedal fatigue to increasing lift and speed. We work with our customers to ensure that they are happy with their VHA blades. If something isn’t right, contact us and we’ll work with you to make it right.